Stop hunting for Internet marketing software - it's a waste of your time! The truth is, most so-called "marketing software" out there are nothing more than over-hyped, over-priced junk. If you've spent a fortune collecting them, you'll understand what I mean. Internet marketing or SEO tools don't have to be expensive. In fact, on this page you'll be able to instantly download five awesome tools that will change your life forever, and all you need to invest is a measly $27. If that sounds expensive to you, then perhaps you need a J.O.B more than you need an Internet business right now. Keyword research is the most vital aspect of any website you plan to create. Target the right keywords, and you'll making autopilot income for years to come. Get them wrong, and you're doomed right from the start! Keyword research tools can cost you up to $297 and yet they give you nothing but the same old junk keywords everyone else already knows about. 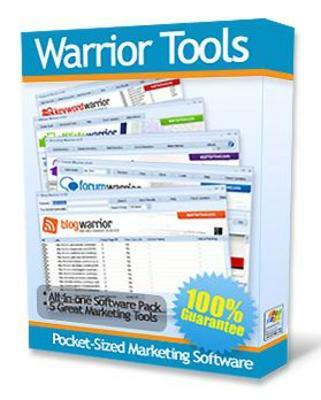 Forget those unless you consider wasting money a form of "mental therapy"..
Our "Keyword Warrior" tool does the same thing as 90 of keyword research software out there, plus more! The second tool you're going to get today is something every blogger needs! Stop flaunting your "newbie" status if you're trying to make money from promoting affiliate products - cover up your affiliate links! Affiliate Warrior is a great tool you can use to create "cloaked" pages that hide the actual URL of the website, which loading and embedding your affiliate cookie in the background! Redirect your cloaked links to any site of your choice so that others won't even notice it's an affiliate link - and youll still be credited for your commissions! You can create either a simple cloak or an advanced cloak - skyrocket your affiliate commissions and elevate yourself to super affiliates status! Ok maybe you're not that into forum marketing - but that's probably because doing it without a proper tool will drive you nuts. Did I hear you say "I need more links"? Directory submissions has always been, and will always be, a legitimate and low-cost method of getting valuable "one-way" links to your website. The more you get, the more Google will love you and reward you with top 10 rankings. However, just like forum marketing, submitting your website to tons of web directories can put a damper on your hope of making fast money online. With Directory Warrior however, you can easily manage your submissions to more than 200 free (or paid) directories! Saves your previous work and records the sites that you have submitted to - you'll never lose track of your campaigns! Sort list according to Pagerank, Alexa rankings, alphabetical order, etc - save time by submitting only to directories worth your time..